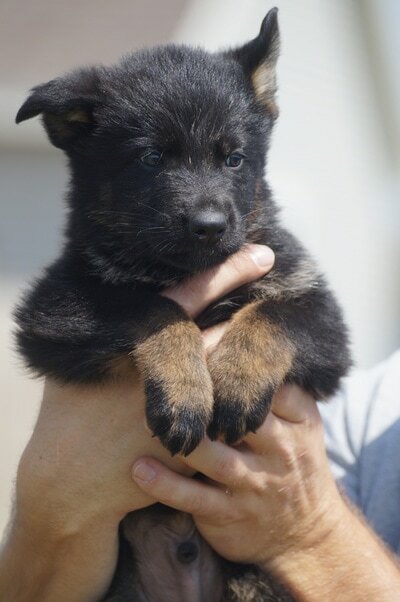 ​Veronika has been bred to Madox and puppies were born a couple days early on 4-26. 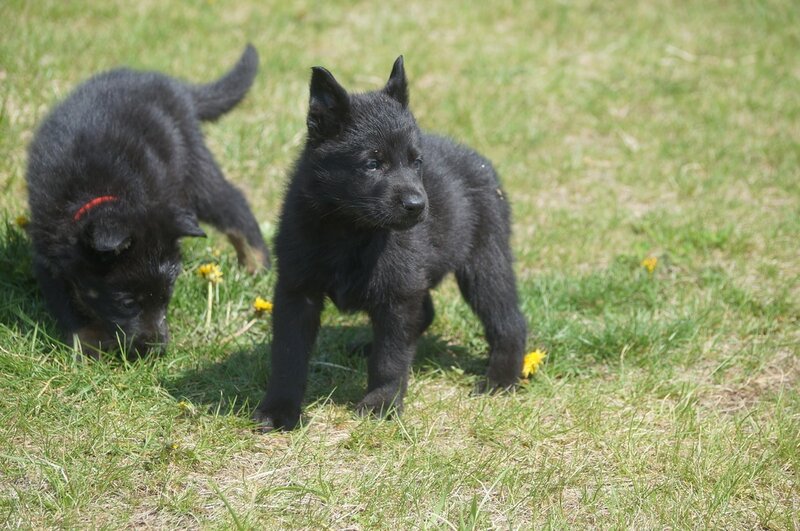 This is a great litter for the working dog enthusiast whose expectations for correct conformation are as high as their expectations for drive and sound temperament. 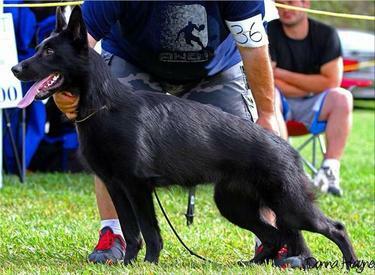 This pairing brings heavy linebreeding on V Uno vom Stadtfeld, who embodies my vision of what a GSD should be. These are some of the lines I built my foundation on, so I have high hopes for these pups. I expect enthusiastic workers with great attitudes and high willingness to please. These pups are expected (but not promised! LOL) to possess a bit less social aggression than some of my other breedings, making them a bit better suited for less-experienced handlers and families wanting more of a "deterrent +" than an actual manstopper. Both parents are socially neutral dogs with kind hearts, clear heads, and balanced prey and defense. Neither goes looking for a fight and both have medium to high thresholds for defense, point being, there should be a bit more room for handler-error in this combination than my breedings stemming from V Capri vom Hagenberg (which is nearly all the others ;) ). Competition aptitude should be excellent, behavior with other animals should be neutral to friendly, and I would anticipate good success in a myriad of venues. 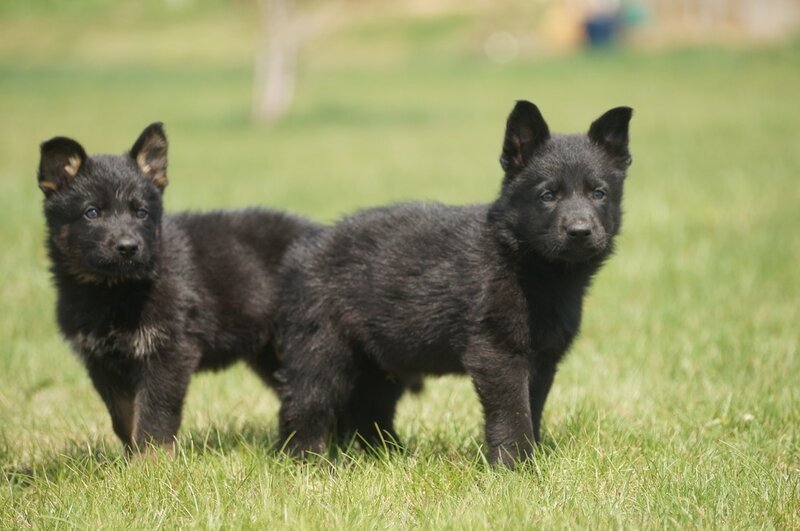 Pups at one month are very uniform in type, show super structure and confidence, are outgoing and affectionate, and are starting to show strong drive. LOLA IS SOLD! Lola is a great puppy- energetic and sassy, but very handler-oriented and willing to please. Loves other animals, loves kids, happy and outgoing temperament, but territorial and is already a good deterrent. Medium-high drive, good environmental confidence, excellent structure. Not recommended for first time dog owner, but possible ok first working dog if handler has access to good training resources. Very level-headed but has a clear idea of what she wants and a ton of tenacity. This is what makes her unsuitable for a complete novice. Lola has been introduced to a crate, sleeps quietly and cleanly through the night, and is clean in the house. Has been hiked off-lead and does very well with recall. ﻿﻿1 Female Puppy AVAILABLE & READY NOW! Price includes ALL puppy vaccinations. She needs only rabies. MAVERICK! 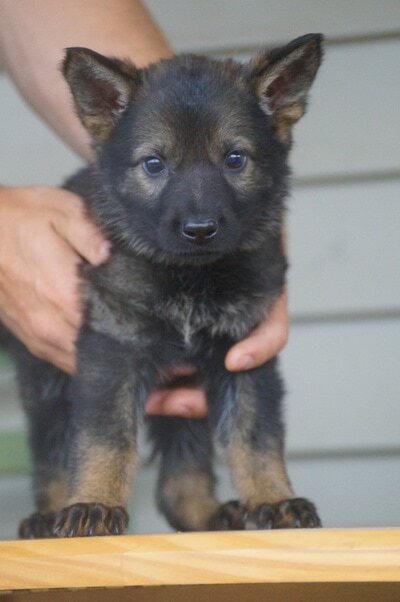 SOLD!Maverick is a great pup; his temperament is as good or better than his looks. 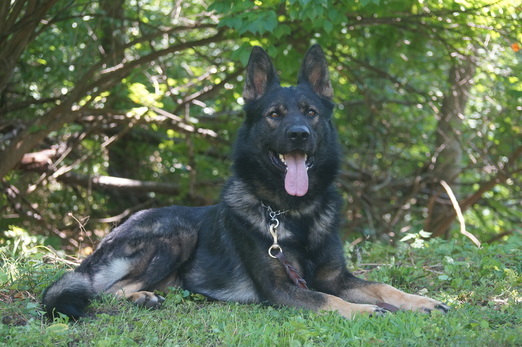 He is not for a first time dog owner, but a dedicated novice with a good trainer might work. Maverick will need to be worked in some capacity and a working home of some sort is greatly preferred. He is fantastic with other animals of all sizes (from Chihuahua to horse) and loves children. Very good drives and tenacity in a relatively calm package (for a working line puppy his age!). Maverick is drop-dead gorgeous and will mature to be a stunning dark red patterned sable with massive bone and a beautiful, strong head. He should excel in the SV show ring as well as in a working venue. 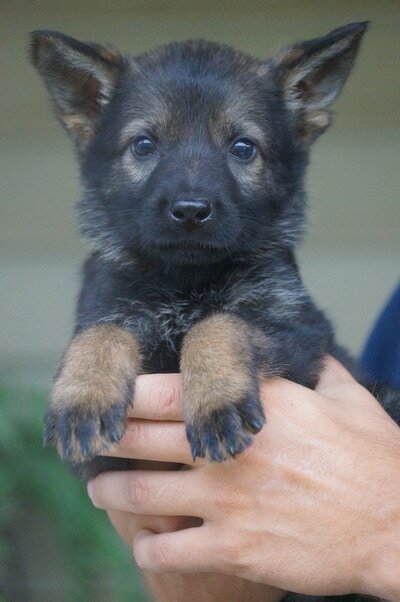 This is the pup for someone who wants to do it all. MAVERICK IS SOLD! SOLD! 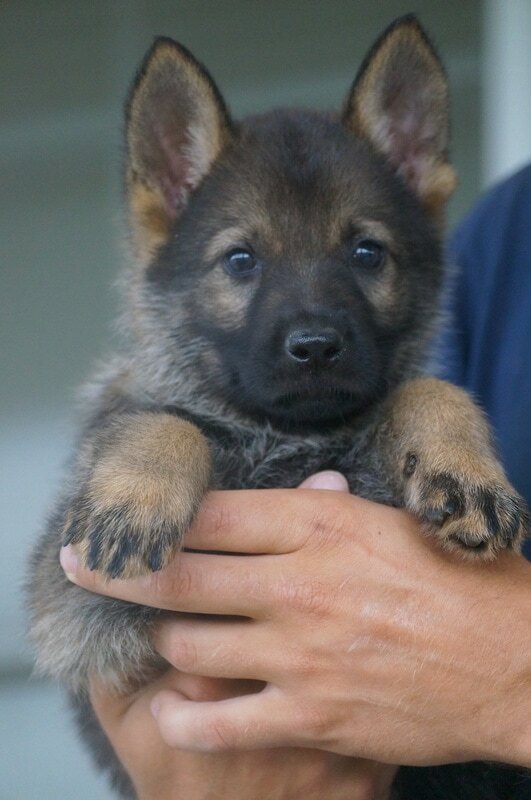 VERY promising male available from Dora & Bravo. See litter description on the "Planned Litters" page. 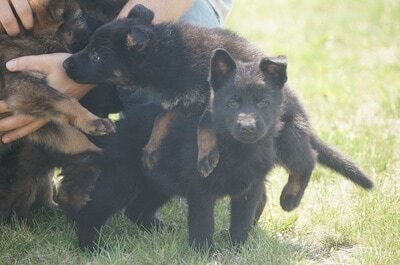 This is a REPEAT BREEDING OF OUR J LITTER! Sable male, Niko, has high potential for a myriad of venues. Excellent temperament and focus, good drive but not hectic. I think this pup could do well at either IPO or SAR- very versatile and eager to please. Niko will chase, hunt, and retrieve anything of any material. Super nice temperament, eager to work, not stubborn, not particularly soft nor dominant. 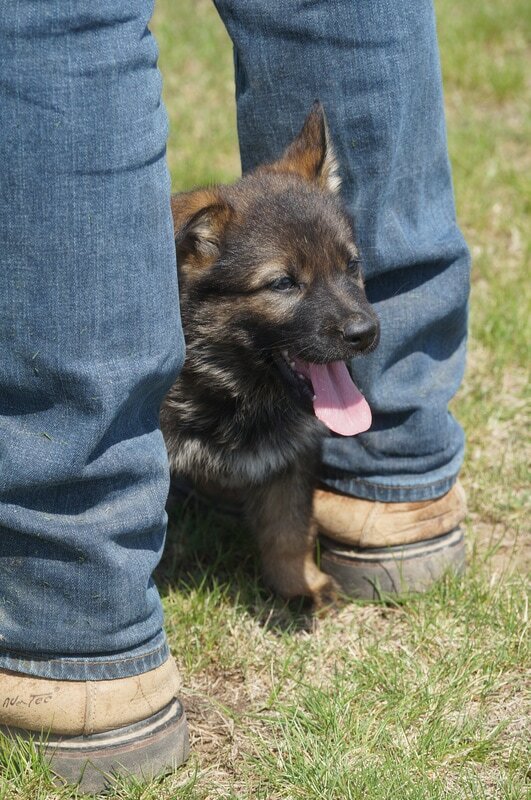 Just a great pup and willing partner for SAR, LE, or sport. Housebroken, crate-trained, wonderful with children and other pets. All around great dog w/outstanding working abilities and potential. FULLY GUARANTEED or I buy him back. Very nice male; I'm extremely proud of my home-bred stud. Great combination of his parents. Large, strong, extremely masculine dog with sound working structure and still very correct per the SV standard. Should earn V rating. Amazing agility. LOVES obstacle work, including playing by himself at any local playground. I do obstacle work with all my dogs but I have never seen a dog just see a ladder and decide he must climb it, just because...or go down the biggest twisty slide, just because it's fun, with no encouragement from me. He's something of a local legend with the kids who frequent the neighborhood playgrounds, aka "The Ladder Climbing Dog!". 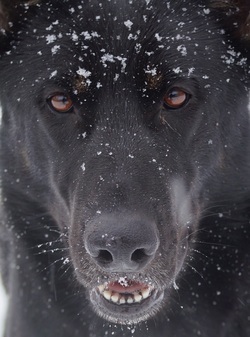 He's a wonderful dog to be around, well-mannered indoors, controllable and sensible, yet a strong worker with excellent balance and strong aggression. Very clownish at play and with young children. Open and willing, but does not suffer fools, and this applies to his handler as well. Obedient, not generally stubborn, but will not tolerate treatment he deems overly harsh or unfair, nor will he oblige a weak handler. Not dog-aggressive but definitely on the dominant side of the spectrum. Will not ignore disrespect. The older he gets, the more his serious side becomes apparent. Expect versatile, level-headed and relatively calm pups (well, at least when they grow up they should be...) with a serious side and excellent off-switch, moderately high prey drive, but should be controllable with proper ground-rules. Strong natural aggression is highly probable. 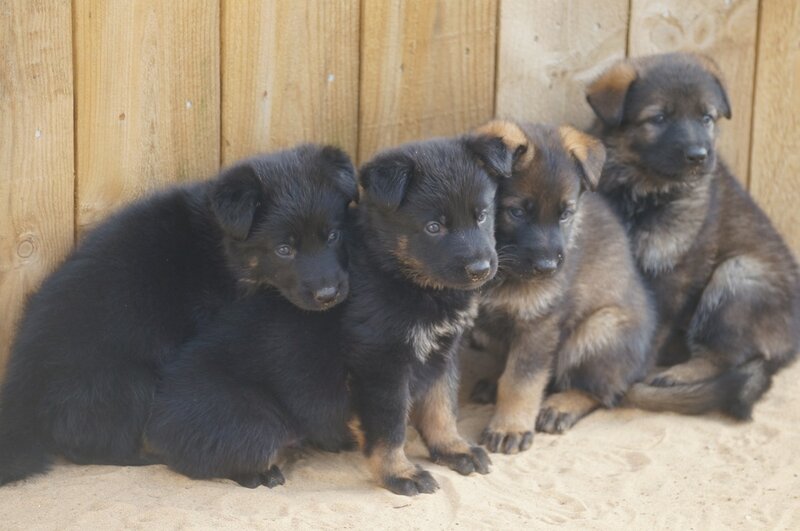 Pups will vary in aptitude, of course, but expecting very good home and personal protection candidates, search and rescue (previous pups are very good, natural trackers) police work, or casual sport. Some pups may even have service potential (note I said service, NOT THERAPY!) as sire and littermate have shown amazing natural intuition regarding both autism and diabetes. Please do not contact me if you're looking for a GSD that acts like a Golden Retriever and will enjoy a myriad of strangers cooing, oohing, and aaahing in their faces and touching them all over. Top level sport is not the main goal of this breeding. Solid club to regional-level performances should be easily attainable, however, that's a byproduct of correct breeding, not my ultimate goal. We're aiming for a more versatile temperament, more of an all-around service-type dog than a pure competition/points dog. 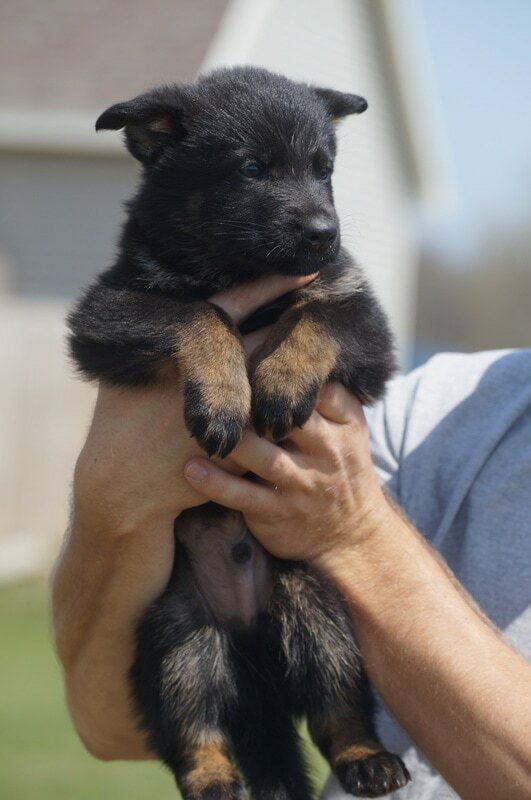 Previous Boy/Capri pups (sire and his littermates) are participating in everything from personal protection to agility and dock-diving, conformation, PSA, IPO, diabetic alert, autism assistance/therapy, and advanced search/tracking. Very dark sables and bicolors will be produced. They should have good structure and overall conformation. 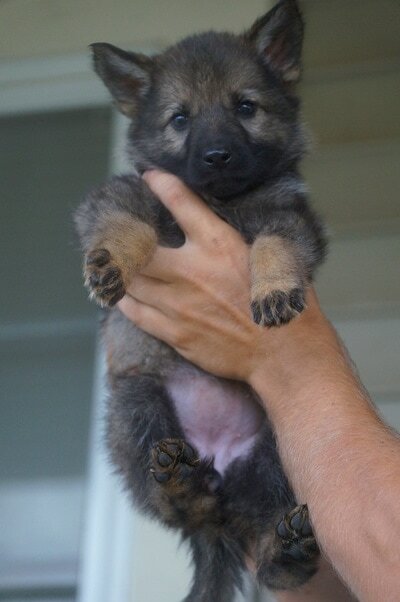 Pups will likely mature to be very large- very upper end of standard. Bone on previous pup is incredible. 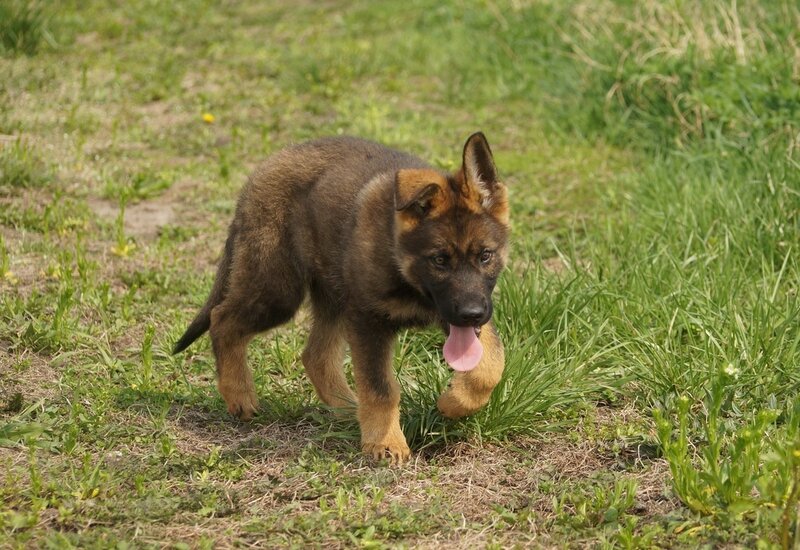 Fronts should be straight, heads should be very strong, & overall substance should be excellent if each dogs' previous litters are any indication. Superior agility and athleticism is present on both sides. This litter is not recommended for novices. Some working dog experience is highly recommended. Full registration pups will have their status granted upon satisfactory joint certifications (either at one year old through the SV or at 2 years old through OFA) & some type of temperament test or working certificate or title which ensures all dogs bred possess suitable temperament to have their genes carried forward. Unfortunately, due to people breaking their word and even signed contracts, as well as lacking general class and morals, my new policy has been made out of necessity to protect my dogs and their offspring from the kind of people who see nothing but dollar signs and have neither the dedication nor the knowledge to breed responsibly or ethically, and whose greed surpasses their compassion for the dogs. I had an amazing mentor who helped me and likewise, I am quite willing to help those who desire to endeavor in responsible, knowledgeable, ethical breeding and start with quality dogs. All deposits are non-refundable unless a suitable pup is not produced. In that case, your deposit will be refunded ASAP. Deposits secure your reservation, thus, should circumstances prevent your completion of the pup purchase, deposit remains with vom Eisenherz GSDs, because that pup has been reserved for you and other homes have been turned away. I did my part by saving that pup for you. 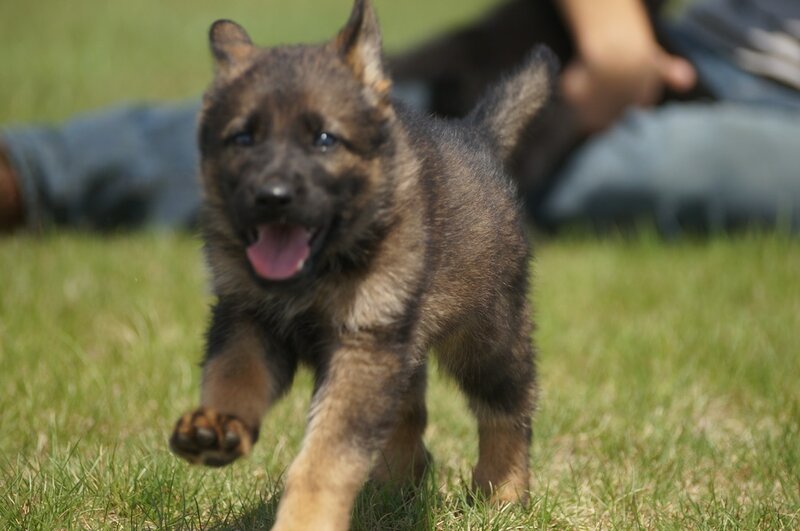 Should you choose not to take the pup, the deposit will not be returned, especially if the pup is over 7 weeks old at the time. There will be no penalty for pups under 2 weeks, and 2-6 weeks will result in a splitting of the deposit. A deposit is a token of your commitment to the pup. If the reason for failure to complete purchase is on my end, then I will refund you. If it's on your end, the deposit is forfeited. Of course, there are extenuating circumstances in which I will certainly try to be reasonable. My first responsibility is to my dogs and their progeny, as they are completely at the mercy of humans. My second is to the buyer. ALL PUPPIES ARE SOLD! 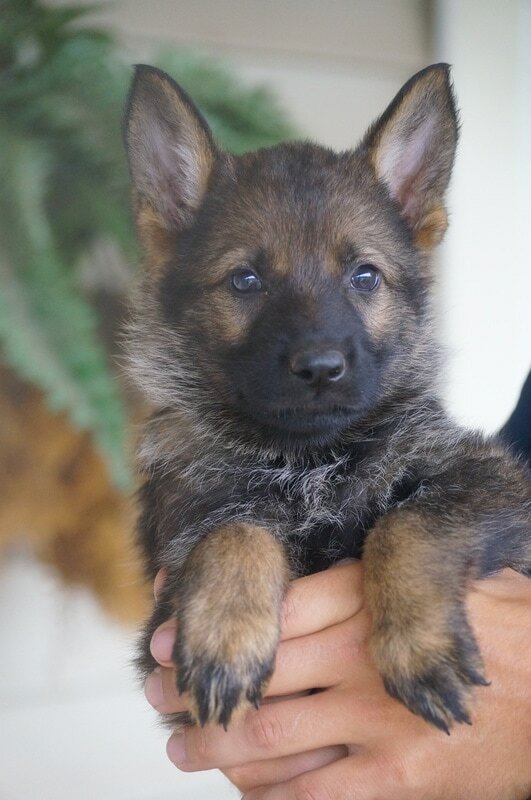 Dora von der Gewurzwiese has been bred to Bravo vom Eisenherz for vom Eisenherz German Shepherd's "J" Litter. Late September puppies are expected. Plenty of time to housebreak before the snow hits! This breeding should produce very workable pups for a myriad of purposes, with very high willingness to please. Both parents are excellent, devoted workers AND family members. Should be a perfect litter for those who want a strong balance of working ability, drive, and ability to assimilate into family life. Both dogs possess strong aggression when warranted. They are more than capable of sport, but also have patrol potential and should make excellent family protection dogs. 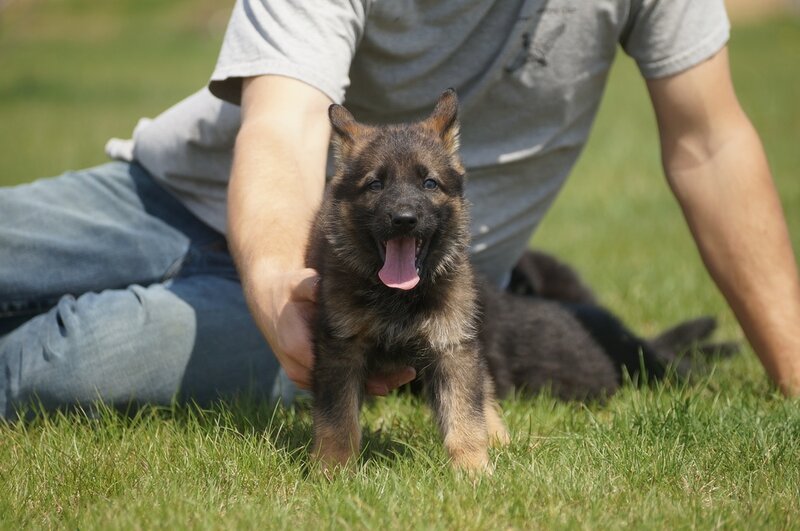 This is a linebreeding on the the pair that produced both V Metin vom Stadtfeld and V Uno vom Stadtfeld, so I anticipate those qualities to come through strongly, which means high trainability, excellent work ethic, and super structure. No animal aggression is expected, and both Bravo and Dora are phenomenal with children of all ages. They are, however VERY protective of them, so some common sense and competent handling is of course recommended. I am unsure as to which recessives Dora carries in terms of coat color and length. I do not believe she carries a long coat recessive, but I have been wrong once or twice. 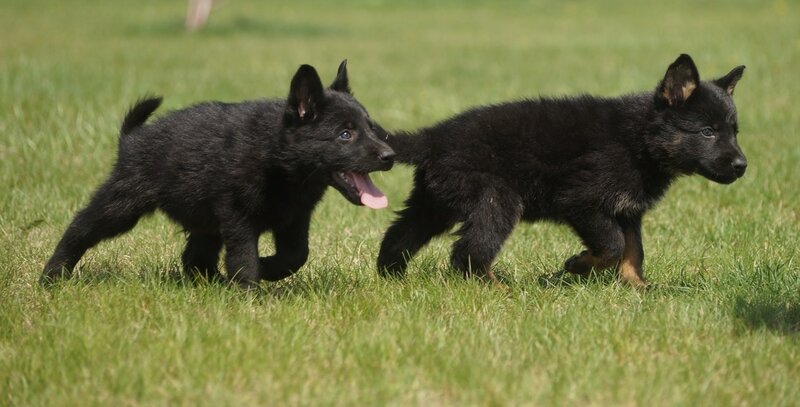 As Bravo is a long stock coat (LSC), I expect pups to all have stock coats but carry a recessive long coat gene, so they should have gorgeous coats like their grandmother, V Capri vom Hagenberg. 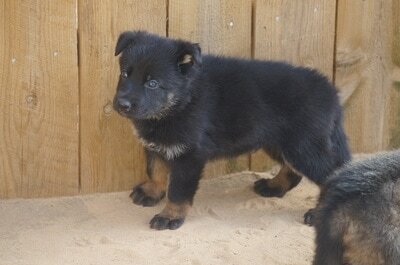 Colors will be sable and bicolor or possibly solid black, depending again on Dora's recessive. I could test her, but I think it's more fun to wait and see. 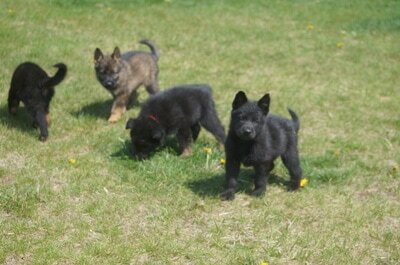 Keep checking Facebook for updates, and also see our PUPPIES PAGE. This little monster is SOLD! Congratulations, Kay! PLEASE READ LITTER DESCRIPTION IN ITS ENTIRETY BEFORE INQUIRING ON THIS BOY! CONGRATULATIONS, JAMEE! V Boy von Zorra son for sale to a loving and competent home. He is a stunning male. Though housebroken, crate trained, and has basic obedience, he is not for a first time owner, lazy, weak, inconsistent, or incompetent owner who will not give him clear direction or is not dedicated to providing a working dog the physical and mental stimulation he needs. Dolce, like Dylan, was one of my picks to keep back from her dam's final litter. A great mix of her parents' best attributes, she is aptly named. Very sweet temperament, intelligent, versatile, sensible, environmentally stable, balanced drives, and highly biddable, Dolce is a calmer version of her stunning mother. Very reasonable price to good, non-breeding home! 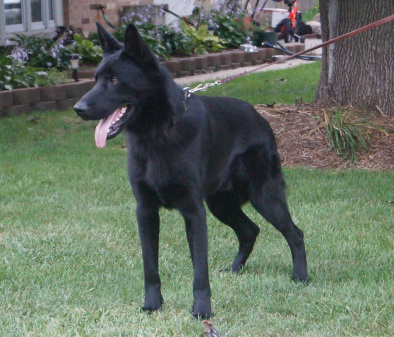 Very nice "total package" type dog- gorgeous in structure and looks and extremely strong, stable temperament. The epitome of versatile, totally solid temperament, suited to many aspects of work. Currently training for a service/protection and tracking capacity for a special needs child. Dylan is a very strong tracker and has super protection potential. Serious temperament, hard when threatened. Very proud of this dog and looking forward to utilizing his genetics in the next couple years. We need more GSDs like Dylan. Ember vom Eisenherz SOLD! SHE'S FINALLY YOURS, JESSICA! 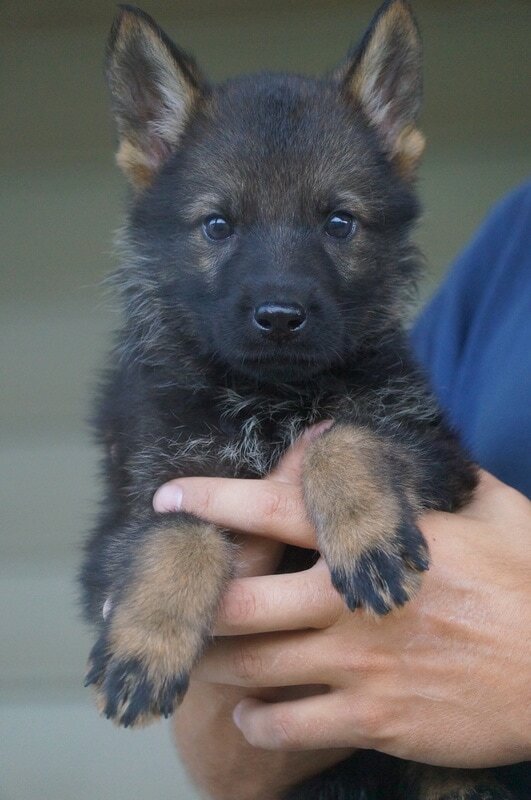 A little firecracker like her grandmother, V Capri vom Hagenberg, she has it all! She has great, sound temperament, a sweet, outgoing, disposition & great looks. She is the spitting image of Capri in overall expression, though will not be as big or heavy. She's very full of herself; she was the first one to climb out of the box & is often the ringleader of puppy mischief. Loves affection but not clingy or anxious. Super friendly and happy. Will sit quietly for cuddling and doesn't mind being held. A bit intense and tough as nails...just like Grandma. Always wagging her tail, nothing gets her down. Very resilient, very confident, very happy. Not dominant with people. Already showing family protection promise- she is a bit territorial and is not afraid to let a trespasser know they are not welcome and there will be consequences should they push their luck. The fact that she has strong temperament does not make her hard to handle! Out of my 2 favorites of all time- exactly what I expected in some regards, & more than I expected in others. She got her mother's happy personality but short fuse, coupled with her father's even but serious temperament , threat response, & amazing intelligence. 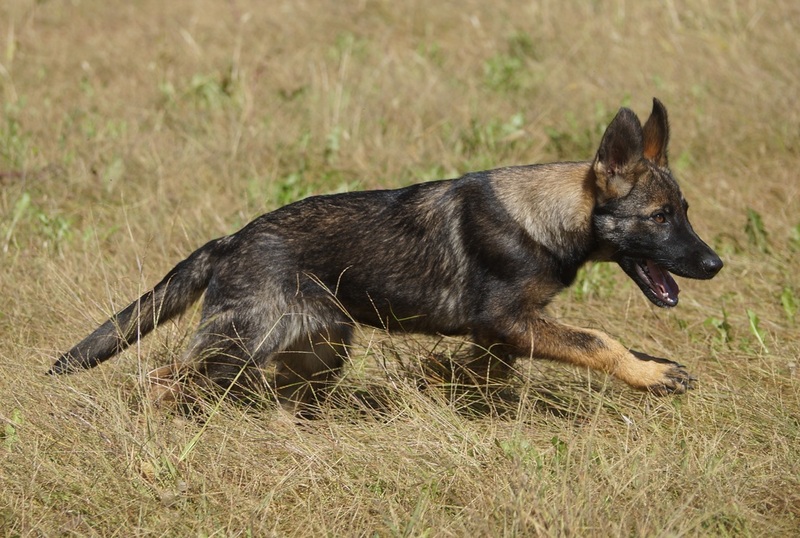 With drive to spare, she's not your grandmother's GSD, but she has both parents' clear heads and sound reasoning, making her able to handle herself well & not be a liability. Mayhem LOVES children, has zero animal aggression & is the kind of dog a threat really doesn't want to mess around with. Very civil, quick to respond, & strong when provoked. Not handler aggressive but will stick up for herself against unfair handling. Ball/toy crazy but never loses her head. 100% trustworthy with children of all ages. Eris suffered a serious injury as a tiny pup. As a result, she may need dental and/or maxillofacial surgery as she matures. Right now, she has malocclusion of her upper and lower jaw, however, at this time, she has a functional jaw and her teeth are not interfering with her gums or her palate. This may change as she continues in this rapid growth phase. Eris will be given free of charge to a qualified home who has access to a good dental/oral surgeon and references will be checked. I will verify that you've been in touch with the surgeon so I know she will receive the care she needs. Eris is a happy puppy, loving and attentive, moderately high drive, good prey drive, high food drive, great with kids and other dogs from large breeds to Chihuahuas. Ehren vom Eisenherz SOLD! Big congrats to Tom, Lisa, Karen & family & good luck to Ehren in his new agility career! Very nice boy- strong but balanced temperament with excellent focus for his age. 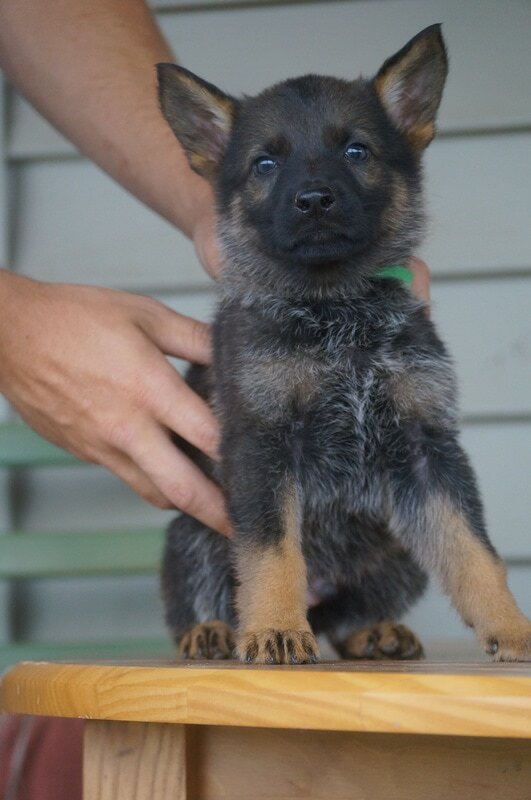 Very confident puppy. Nice level of drives for his age. Overall fairly calm, with periods of great intensity and tenacity, so some experience is recommended, but he's not going to be over-the-top driven or uncontrollable. Looking like he will have a great "off switch" when mature. He should be more than enough for the average working dog person to compete with. Strong temperament and showed very early protective/territorial tendencies. Very nicely built black and deep red with very mature expression & a "look of eagles". Great structure, good bone, nice head, tight cat-like feet. I predict he will take after Capri's build and facial features. Full registration available. Co-own possible. ﻿SOLD! Congrats to Nick & family! Stunning puppy. Largest from birth, and the firstborn, he has a quiet presence about him. 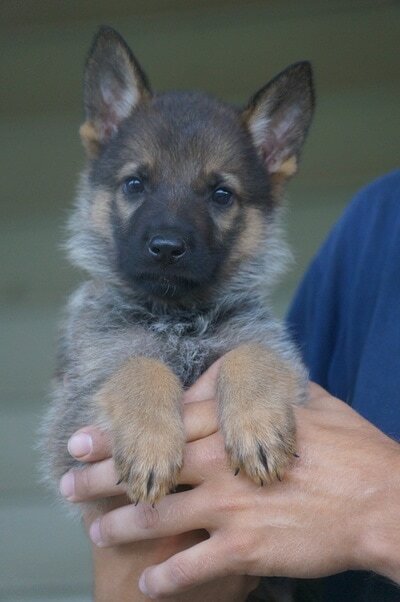 Calmest pup in the bunch, likes to chase & play with balls & tugs but has zero hectic energy. Extremely quiet. If he barks, it's directly at me to get my attention because he needs to go outside. Nearly housebroken and very clean habits. A bit aloof already...ok, a lot aloof. Curious & independent. Likes to climb obstacles, not bothered by slick footing or heights. Enjoys the company of children. Doesn't start fights. More of a one person dog in that he is disinterested in people besides me. Heavy-boned, deep pigment. Beautiful, blocky head & muzzle. Show potential. Should mature to a dark black and red saddle or possible blanket, but the back of his head and base of his ears are turning very dark red already, so I expect him to have a dark traditional mask. He is absolutely gorgeous. Ears are starting to stand early in the day, coming back down at night. Another week or two and I think they'll be up for good.